I felt it was worthwhile bringing this article, published 7 years ago, to your attention once again as the scam goes on with the wealthy stuffing their pockets with money extorted from tax payers & power users – the scam continues! The situation has become even more scandalous and as we charge towards disaster no one seems to be doing a blind thing to rectify the inevitable misery this scam will bring at almost exactly the most difficult time, financially as Britain adjusts to maximise on the benefits of BreXit! Does anyone care about Britain? We see the House of Lords trying to feather their nests by betraying the majority vote of the British electorate. We see the EU angling and contriving to try to keep its hand in the British Public Purse to continue subsidising their failing fantasies. We have Ireland trying to gain all the benefits of work, exports, education and economic size yet trying to blackmail Britain to accept open borders and flood in any goods, people and possibly even arms for their own gain at Britain’s expense. We have the Warmist scams continuing and now the Government is talking of providing (Free) Diesel Generators to Wind Turbine owners to mask the fact that Wind Turbines are grossly ineficient and can not be operated effectively without running conventional power stations alongside to mask their failure! In what way are these monsterous edifices in any way GREEN? The output of CO2 (if you buy into the myth that global warming is a man made event!) the output to manufacture the cement, transportation, rebar and steel frame exceeds any saving in subsequent power delivery – This does not make allowance for the environmental damage the unrecyclability to the tower skin nor the fiber based wind sails and let us not forget the removal of the immense reenforced concrete blocks on which these useless towers stand. Who do YOU believe will pick up the bill when Wind Turbines are osolertye – well of course it will be your children and grandchildren, and for the youngest amongst you it will be YOUR pension funds! Scarcely a day goes by without more evidence to show why the Government’s obsession with wind turbines, now at the centre of our national energy policy, is one of the greatest political blunders of our time. So unpopular are wind turbines that our own Government has just offered ‘bribes’ to local communities, in the form of lower council tax and electricity bills. In Scotland, the 800 residents of the beautiful island of Tiree are desperately trying to resist Alex Salmond’s plans to railroad through what will be the largest offshore windfarm in the world, covering 139 square miles off their coast, which they say will destroy their community by driving away the tourists who provide much of their living. So riddled with environmental hypocrisy is the lobbying for wind energy that a recent newspaper report exposed the immense human and ecological catastrophe being inflicted on northern China by the extraction of the rare earth minerals needed to make the giant magnets that every turbine in the West uses to generate its power. Here in a nutshell are some of the reasons why people are beginning to wake up to the horrific downside of the wind business. And since I began writing about wind turbines nine years ago, I have come to see how the case for them rests on three great lies. The first is the pretence that turbines are anything other than ludicrously inefficient. Furthermore, as they increase in number (the Government wants to see 10,000 more in the next few years) it will, quite farcically, become necessary to build a dozen or more gas-fired power stations, running all the time and emitting CO2, simply to provide instant back-up for when the wind drops. The second great lie about wind power is the pretence that it is not a preposterously expensive way to produce electricity. 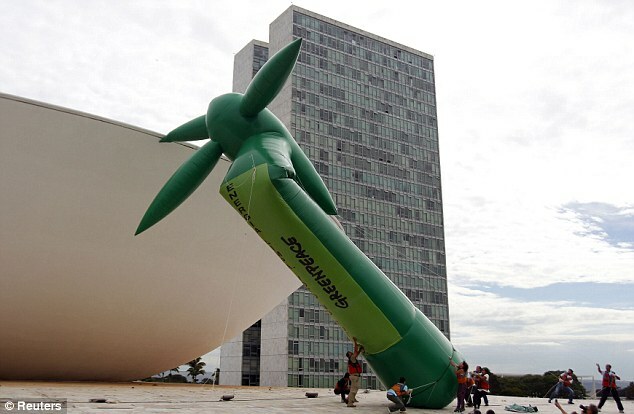 No one would dream of building wind turbines unless they were guaranteed a huge government subsidy. What other industry gets a public subsidy equivalent to 100 or even 200 per cent of the value of what it produces? What we were not told was that its actual output will average only a mere 80 megawatts, a tenth of that supplied by a gas-fired power station — for which we will all be paying a subsidy of £60million a year, or £1.5billion over the 25-year lifespan of the turbines. Even if you believe that curbing our use of fossil fuels could change the Earth’s climate, the CO2 reduction achieved by wind turbines is so insignificant that one large windfarm saves considerably less in a year than is given off over the same period by a single jumbo jet flying daily between Britain and America. 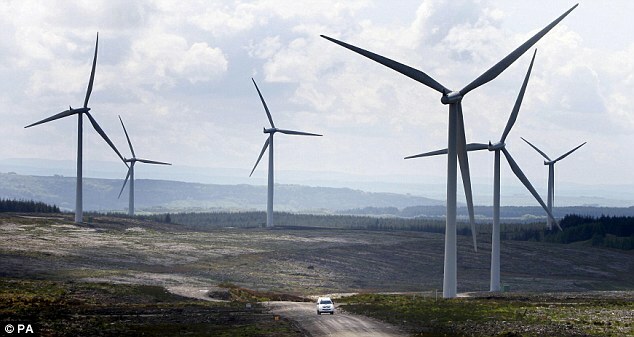 Then, of course, the construction of the turbines generates enormous CO2 emissions as a result of the mining and smelting of the metals used, the carbon-intensive cement needed for their huge concrete foundations, the building of miles of road often needed to move them to the site, and the releasing of immense quantities of CO2 locked up in the peat bogs where many turbines are built. When you consider, too, those gas-fired power stations wastefully running 24 hours a day just to provide back-up for the intermittency of the wind, any savings will vanish altogether. Yet it is on the strength of these three massive self-deceptions that our Government has embarked on one of the most reckless gambles in our political history: the idea that we can look to the vagaries of the wind to provide nearly a third of the electricity we need to keep our economy running, well over 90 per cent of which is still currently supplied by coal, gas and nuclear power. It is true that this target of raising the contribution made by wind by more than ten times in the next nine years was set by the EU. But it is no good blaming Brussels for such an absurdly ambitious target, because no one was keener to adopt it than our own politicians, led first by Gordon Brown and Ed Miliband and now by David Cameron and the Energy Secretary Chris Huhne. To meet this target, our Government wants to see us spend £100billion on building 10,000 more turbines, plus another £40billion on connecting them all up to the grid. According to the electricity industry, we will then need to spend another £100billion on those conventional power stations to provide back-up — all of which adds up to £240billion by 2020, or just over £1,000 a year for every household in the land. 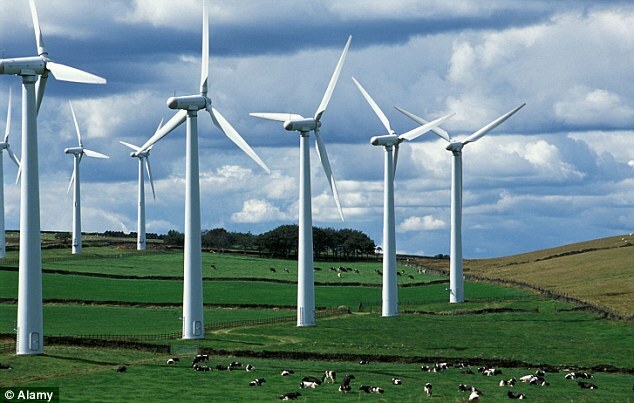 And for this our politicians are quite happy to see our countryside and the seas around our coasts smothered in vast arrays of giant industrial machines, all to produce an amount of electricity that could be provided by conventional power stations at a tenth of the cost. This flight from reality is truly one of the greatest follies. But what turns it from a crazed fantasy to a potential catastrophe is that Britain will soon face a huge shortfall in its electricity supplies, when we see the shutdown of conventional power stations, which currently meet nearly 40 per cent of our electricity needs. All but two of our ageing nuclear power stations are nearing the end of their useful life, with little chance of them being replaced for many years. Six of our large coal-fired stations will be forced to close under an EU anti-pollution directive, and our Government is doing its best to ensure that we build no more. There is no way we can hope to make up more than a fraction of the resulting energy gap solely with wind turbines, for the simple and obvious reason that wind is such an intermittent and unreliable energy source. Meanwhile, this country will soon be facing a colossal energy gap, while relying on politically unreliable countries such as Russia and Algeria for gas supplies. What we are seeing, in short, is the price we are beginning to pay for the past two decades, during which our energy policy has become hopelessly skewed by the siren calls of the environmentalists, first in persuading our politicians to switch from coal and not to build any more nuclear power stations, and then to fall for the quixotic dream that we could gamble our country’s future on the ‘free’ and ‘clean’ power of wind and sun. All over the EU, other politicians are waking up to the dead-end to which this madness has been leading us. The Danes, who have built more wind turbines per head than anyone, have realised the idiocy of a policy that has given them the highest electricity prices in Europe, while they have to import much of their power from abroad. In Spain, their rush for wind and solar power has proved a national disaster. In Germany, having built more turbines than any other country in the world, they are now building new coal-fired stations like crazy. 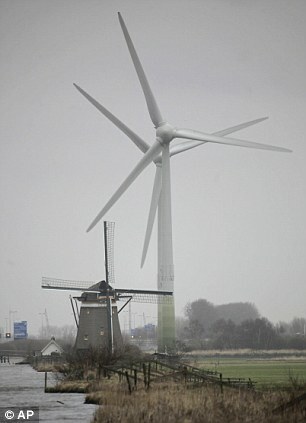 In Holland, meanwhile, they have now given two fingers to the EU by slashing all their renewables subsidies. Only in Britain is our political class still so imprisoned in its infatuation with wind that it is prepared to court this dangerously misguided pipedream.